In 2008, I hit the rock bottom. I was working as a Chief Marketing officer for a technology company but I just couldn’t go on anymore. I was so unhappy in my job that I started to become very sick. I wanted to give it all up. The guilt I felt was beyond what words could describe. The sacrifices my family and I had made over the years. The kids I had to raise, the mortgage I had to pay. I had spent my lifetime to get here, and yet I was so unhappy. It felt completely illogical. I was just going to quit? Walk out of this path completely? I felt weak. Giving up felt like a weakness. But what is worse, having a well-paid job feeling miserable or giving myself a chance to start living again? To climb back from rock bottom, I knew I had to do something completely differently. But I had a dilemma, I suddenly realised that I knew nothing about myself. I had no idea what my real talent was. Besides marketing jobs, I was practically unemployable. I was able to list many things I was good at but had no interest in. Or the things I was interested in, I didn’t have the skill nor experience to make enough money to maintain my family obligation. But by then, I had become obsessed with finding the answer. And I was determined to find it without turning my life upside down. After a period of soul-searching, I finally came across an approach that ultimately changed my life, my career, and everything. The Realise2 Strength Approach created by Dr Alex Linley has the notion that we could only sustain our success, happiness and performance if we live and work in accordance with our authentic strengths. I found my answer. I found my zest back. Basically, what I did in my entire career was wrong, which was why I ended up where I was. I spent most my time doing the things that were not my natural strengths. I learned to be good at my job only through working hard. When we don’t work from our natural strengths, we max out pretty quickly, no matter how hard we try, how smart we are, and how determined we might be. We will hit the ceiling. To keep performance up, we work even harder only feel more exhausted, barely surviving. We then lose our confidence and feel burned out. Natural strengths are the things we are good at and come to us naturally. When we use them, we feel like we are in our element, work becomes interesting. When we don’t use them, we feel bored and get stuck in groundhog day. This is why I felt unhappy because every day I turned up at work trying to be somebody I was not. I was good at what I did but most didn’t come to me naturally. This is why I felt so unauthentic and it was exhausting. But for a long time, I would not admit it to myself, scared that I would lose everything if I made any change. And I couldn’t imagine spending another 20 years starting from scratch in another field, even I fancy about them. The truth is we can master things exceptionally fast if we use our natural strengths. Research has shown when we work with our strengths, we learn things faster and more effortlessly. I could relate to that. I spent 20 years in studying computers, I only achieved average competency, and I felt dumb most days. Once I started learning strengths psychology, I thrived. Learning was easy for me and I got accepted into a Doctoral program within 12 months. Do you know I did Excel training 5 times in my career and I still can barely do Macro, yet I didn’t have to learn how to coach, facilitate, or how to be strategic? They come to me naturally. Can you relate to this? Can you find your own examples? What I love most about the strength approach is how simple it is. I shaped my future roles so I got to spend 80-90% time in my strengths zone. The renewed energy and passion helped me thrive in every area of life and attracted right opportunities. I was offered a senior coach role with Right Management, and a strategy consulting director role with Adobe which I loved very much, despite I had no experience in either field, all I had was my natural strengths. You see, strength creates clarity, clarity creates confidence, and confidence is infectious. Many assume that they had to quit corporate altogether whenever they think of pursuing a satisfying career. Strength is like the muscle. If you don’t use it, it will get rusty. So challenge yourself to find creative ways to use strengths in your current job. If you don’t, even when you are ready to follow your passion, it is unlikely you will make it work. If you still don’t feel the job is best suited after you have tried the strength approach, leave, but then you at least know which jobs you should pursue that would make the most of your strengths. How many of us get excited when we begin a new job, only 6 months later, felt the same dreadful feeling? That is because we hadn’t learned how to use our strengths. In most situations, it is our ability to make the most of our strengths will lead us to a meaningful and happy career. Strengths approach changed my career and life. The happiness, clarity, and confidence I felt were beyond what words could describe. I now teach people full time on how to use the strength approach to work towards a rewarding and meaningful career. So I found my career path and purpose by giving up my non-strengths and letting my natural strengths shine. 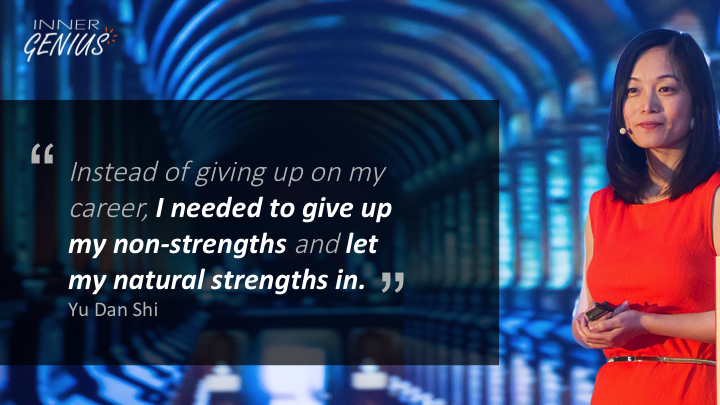 What non-strengths can you give up today? So you can let some of your natural strengths start to shine?